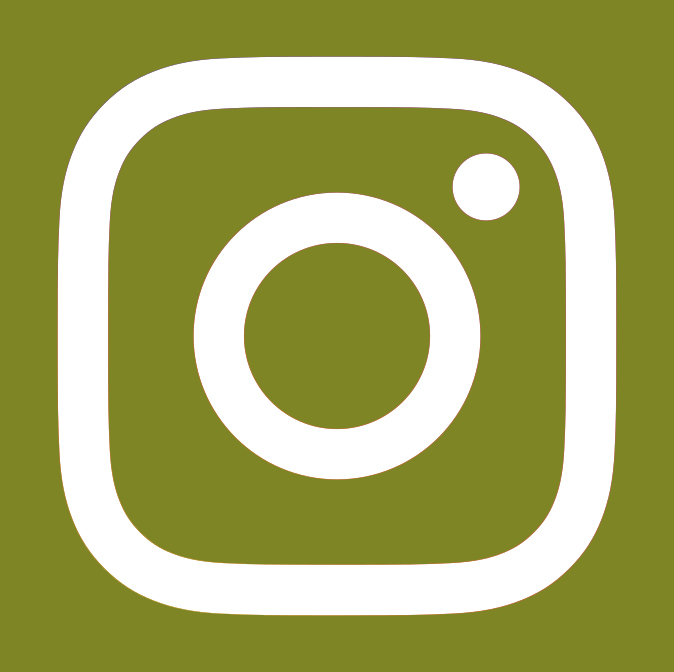 Design and development of a manual for the construction of a training and administration camp for the Chinko Conservation Project in the east of the Central African Republic. The Central African Republic is a former French colony, which has never really found a positive development since its independence. In repeating crisis and without a stable government and poor infrastructure, many ecosystems are lost due to illegal exploitation of resources and poor administration. The Chinko Project is concentrated on the region of the Chinko-Mbari-Basin in the east of the country. 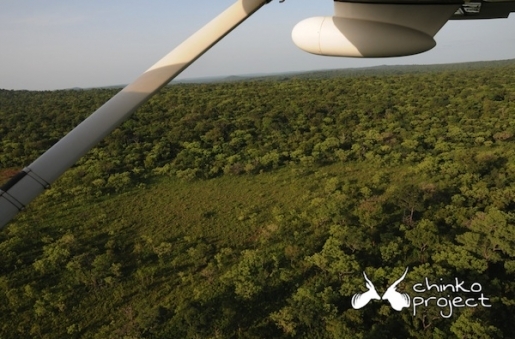 The project area is formed by several, former hunting reserves. The broader region is one of the most pristine and dominantly untouched ecosystems, which still exist in such a size in Africa at all. 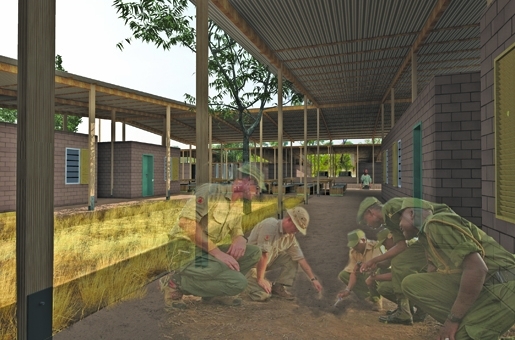 In order to effectively protect the enormous area of around 18 000 km2 against illegal exploitation, rebels and organized poaching – the project has a primary objective of training park rangers and at the same time to start with social infrastructure programmes in the surrounding areas to the park. 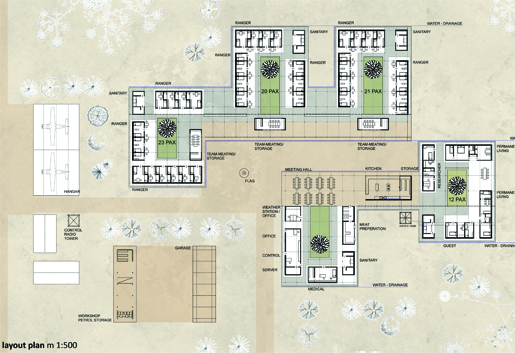 For the central infrastructure camp, a master plan was designed, which is generally composed of several courtyard structures. 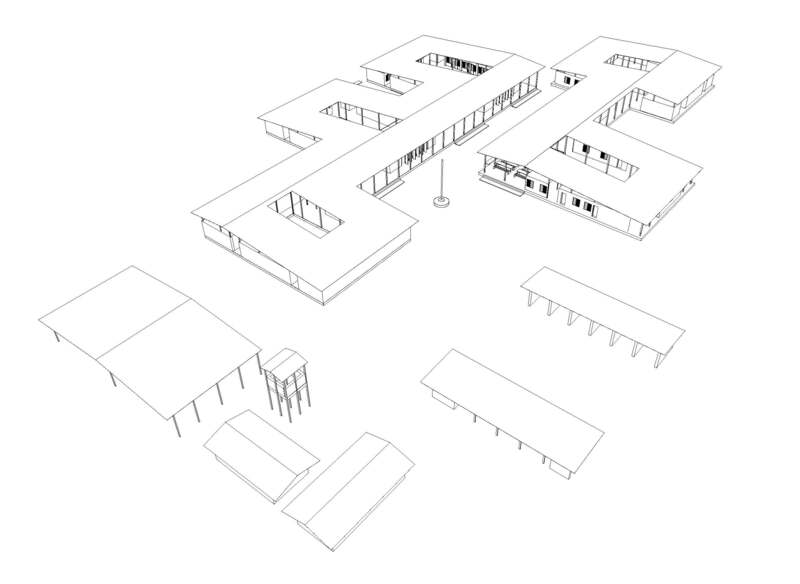 Modular, with a regular grid, a building structure is designed which can be adaptable in its size and volume. 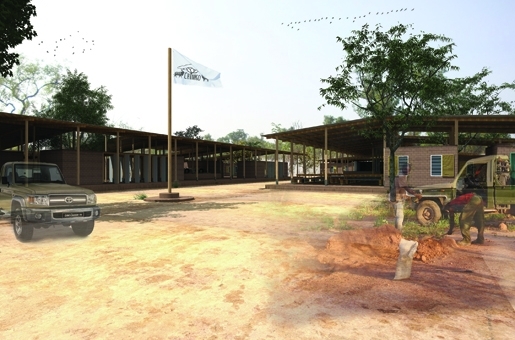 With this ‘building system’, the camp can be resized to the possibly changing priorities in the central camp and at the same time is a module that can directly be used for smaller camps around the patrolling routes of the rangers. 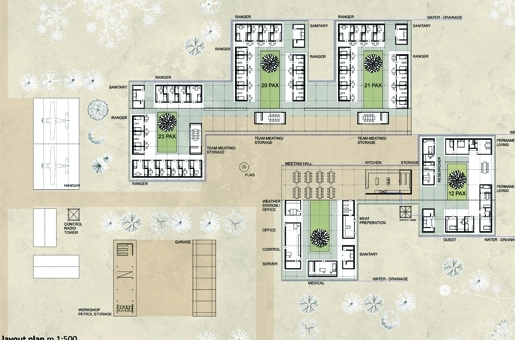 The master plan involves living quarters for up to 60 park rangers, 10 constant employees, for 2 families of the management, scientists and buildings for storage, jeeps, medical equipment, watchtowers, controlling units, sanitary units, offices, kitchen, workshop and several side buildings like water towers. 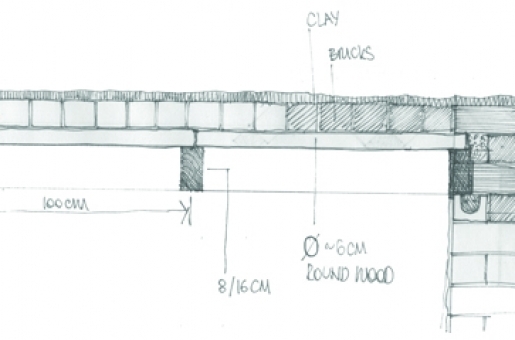 Used are air-dried earthen bricks (adobes), stabilized rammed earth foundations, as well as hand-hacked beams of African hardwoods. In order to ensure the durability of the central camp, the management decided to only use corrugated steel for the roof coverage. 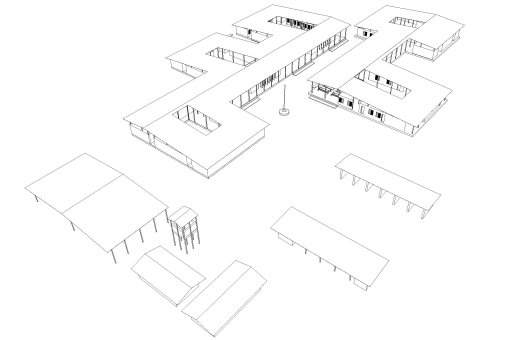 Additionally to the design, the group also developed technical building recommendations and construction detail drawings, also to ensure the implementation quality. 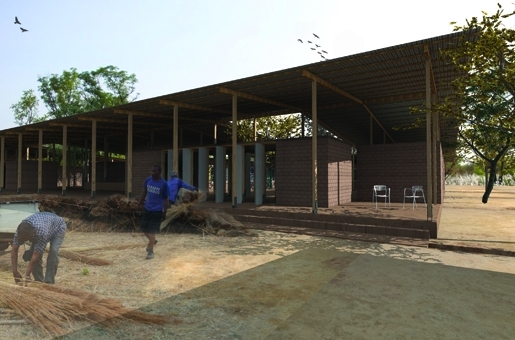 The building project will be supported and financed to the most part by African Parks. The construction will start in the beginning of October 2014, after the coming rainy season and is dependant on the security situation and logistical possibilities, which have deteriorated since December 2013 due to cultural clashes.